We all have roots. Trees, cities, villages, families, humankind, and even simple things, like flowers. Both biological and historical. The fauna that grows from the earth has physical roots. These roots serve many purposes - some can create wholesome, sustainable meals and others have great medicinal properties. 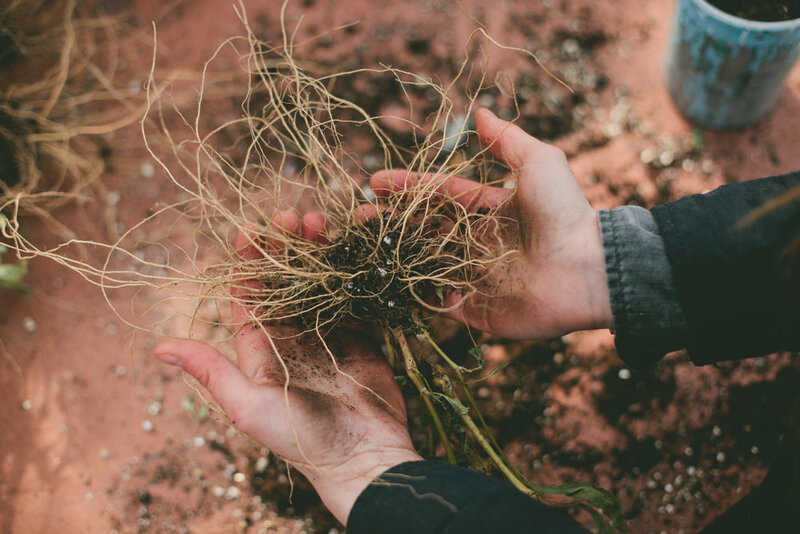 The roots of a plant are one of it’s lifelines, collecting water and nutrients to nurture and support health and new growth. Plants and flowers also create stability and bind the earth together with their roots after heavy rain. Foret Design Studio has become a staple to the New England floral landscape. Erin and Rose have effortlessly worked to create some of the most stunning flower arrangements we’ve seen. Their care and attention to detail that goes into each piece of work is reflective of the passion and influence they draw from the raw materials used: flowers. We’ve been ever-so-anxious to collabrote with this talented duo, and finally were given the chance shortly after announcing the theme of our 8th issue, The Roots Issue. We excitedly opened an email from Erin, that described a deeply moody yet beautiful arrangement accentuated by the very name of this issue, roots. It was something we’ve never seen done before, but we could not wait to document these ladies as they crafted and created such an emotional centerpiece. “When thinking about the history and the function of roots, we thought about how we could make them the stars of the show for an arrangement. Who says it always has to be a stunning café au lait dahlia or the perfect garden rose? We set out to Fivefork Farm in Upton, Ma., where many of our flowers are born and raised. It felt only appropriate to arrange collected gomphrena roots and other foliage in a space that is so deeply rooted in the origins of our own product." Watching Rose and Erin work was inspiring. They have an effortless and uncomplicated grace that is something to admire. Their affinity for nature’s blossoms indicates an unwavering understanding of nature and a deeply rooted commitment to showcasing its true beauty. To say it stops there is an understatement. “Our business even has a lineage. It began with a deep rooted friendship and a passion for being in touch with nature. Often, when describing our business, we use a flower's life as a metaphor: creating roots, building and nurturing growth (the stem), and allowing the flower to blossom. Roots, for us, are the beginning. The origin. The birthplace."